The box of tapes in the basement has yielded this. I'm not sure where it came from. I'm not sure what it is (other than really, really good) - it's probably not an official release (then how the hell did I get it?!?!). I remember the Soft Tips as being made up of twin heartthrobs Steve and Mark Schroeder. But a little googling seems to indicate that Derek McEwen (later of Rayovaq) was also involved here. This is great, shoegaze-inspired pop. 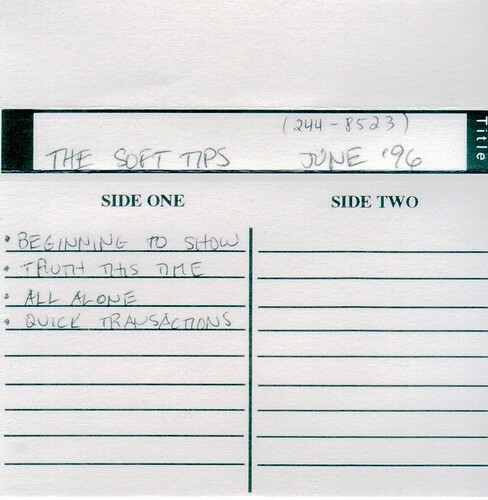 I seem to remember the Soft Tips doing a live cover of the People's Court theme song (one of those Live Drive nights) that took more cues from Derek than the Schroeders that was particularly good. Hey, Cluttererer: can you confirm the Soft Tips' membership? It was the Schroeder twins, for sure. Derek, for sure (but perhaps not from the outset). Can't remember who else. Liz would know (and, uh, Derek). There was a dark, floppy haired frontman for a while that wasn't a Schroeder wasn't there? It was Marc Schroeder, Steve Schroeder, Dan Willock and (later) Derek McEwen. The tape in question was recorded on a very old 4-track reel-to-reel by the band in their basement space. It's the first work they released (pre-first gig). About 30 copies were distributed to CJSW DJs, which is, I guess, how it found its way here. Derek didn't join the band until well after (not to diminish his later contributions). Also: it wasn't the People's Court theme song. It was Adam 12. This last comment is obviously from Dan W - too much insider knowledge that only Dan would know and remember, ie the type of recorder used and where it was located and the where the demos were distributed. Great band saw them a few times - still have the tape ans still listen to it (converted it to MP3 a while back). From former member of Fear of Flight another old Calgary band. Yeah, the Soft Tips formed in about 1995 and we recored these 4 in my basement in 1996 - 2 on 4-track and 2 on 8 track reel to reel - I have the masters and I'm currently remixing them (with others that I recorded after the Soft Tips - check out Dan Willock on soundcloud for a couple of them). Derek joined after these recordings, but there are 2 songs we "put out" with him as well: Speedster and Delilah. Dan Willock, Steve Schroeder, and Graham Jones formed Fear of Flight in high school, and moved to Toronto to "make it big"/ go to school in 1990. Dan moved back to Calgary in '92 and started jamming with Marc Schroeder and Jon Pynn in 1993, and called themselves Blanche (Jon was later the drummer in Shiver). Steve Schroeder came back to Calgary and replaced Jon on drums in 1995, and the Soft Tips were born. We made the tape shortly after, but always thought we needed another guitarist, so Derek joined in about August or September 1996. We played quite a few gigs with this line-up, and recorded a few songs. The band broke up in about April 1997 due to various reasons - conflicting egos, etc. (the usual suspects ;). We did however reform for a "reunion gig" in 2007 in Manitoba for my wedding...which was a lot of fun. I still have the original 8-track reel to reel we recorded a lot of our stuff on, and have recently transfered the songs to my basement digital studio (Cubase). Dan! Thanks for the back story. I went to WCHS, I'm pretty sure I remember Fear of Flight at a battle of the bands thing. I'll check out the SoundCloud - and would really love to hear more Soft Tips! Thanks Gene! Yup, we were in a battle of the bands, and also played one of the dances. I'll post when any more Soft Tips songs are available. Stay tuned, and thanks for the interest!